Installing the hinges is a rather straightforward process. However, the instructions really need to be modified to do a test fitting of the door before the hinges are epoxied to the door frame. I discovered that the location for one of the door frame hinges was a bit oversanded in the factory creating a hinge that didnt sit squarely to the door. I didn’t notice this until I tried test fitting the door. It drooped! I ended up having to cut through the structual epoxy, fix the door hinge location with some additional layups, re-test the fit, then reinstall the hinge with epoxy. Since the hinges also get screwed to the doors it would have been easy to fix the problem by test fitting the doors with just the hinges screwed on. Oh well. Working with curved doors is not the easiest thing in the world, especially when I need to install the hinges on a perfectly straight line! Using these saw horses worked perfectly. I just clamped the bottom edges of the doors to the top of the horses leaving the hinge locations flat against the table! Sometimes I amaze myself! I'm aligning the door hinges to make sure they are straight before installing them on the doors. I’m using clecos to hold everything into place. My straightedge is some 2” x 1/8” aluminum stock from Home Depot. 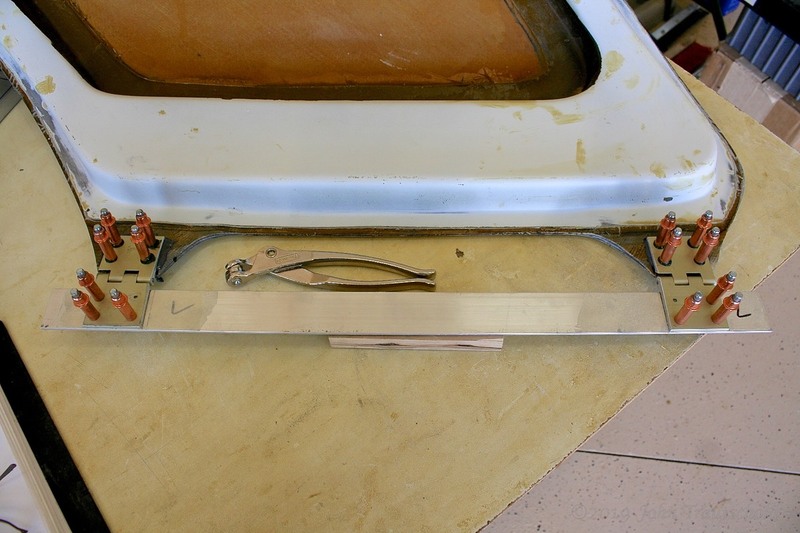 I mounted the hinges to the aluminum and then used that as a guide to mount the hinges to the doors. Simple and cheap - it worked good! 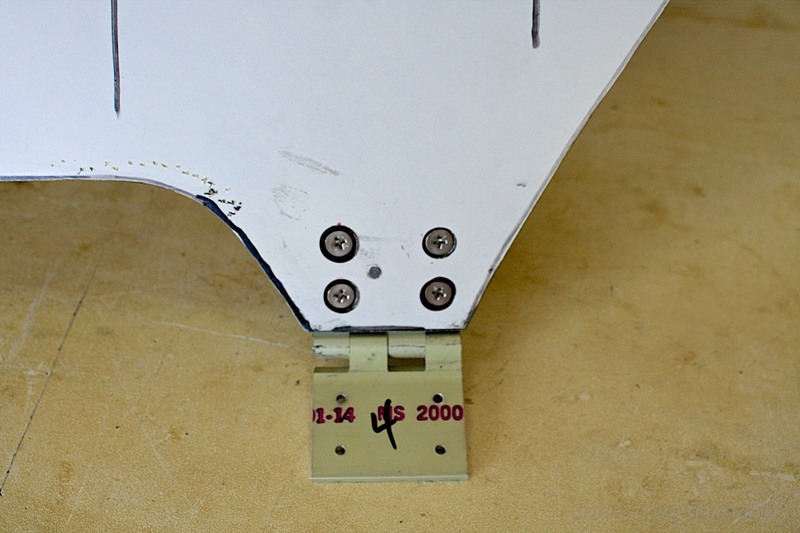 A closeup view of the door hinges embedded in structural epoxy along with the straightedge for alignment while the epoxy cures. Here’s a closeup of one of the finished hinges. Not only is the hinge epoxied to the door, it’s also screwed down. Eventually the screws get covered with a coating of a finish epoxy so that you don’t see them. That’s why they are countersunk a bit deeper than the surface of the door. The factory wants these hinges locked in place so in addition to the epoxy they also use screws! 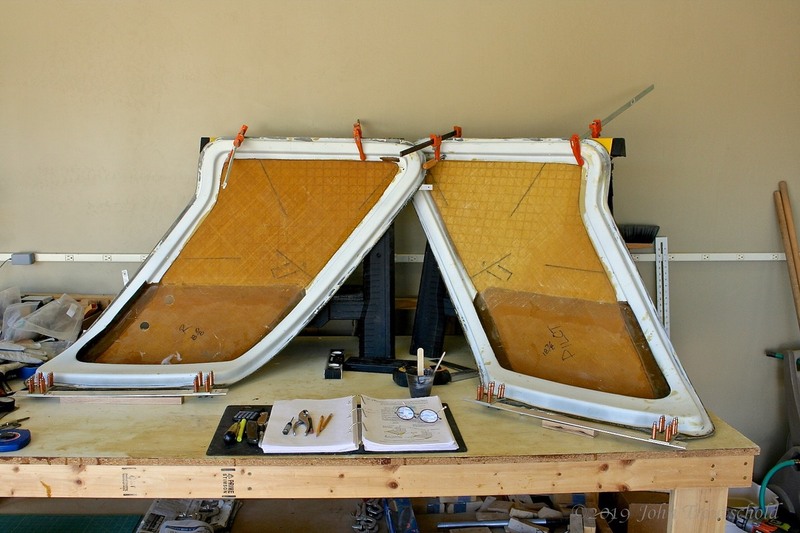 The next step is to install the doors to the fuselage. See Section 5.2.5 for that process. This is also where I noticed that the pilot side door was drooping a bit. I was able to fix the problem but it wasn’t easy.